What happens when people band together for a good cause? Magic happens of course! This year Santa Clause was extra kind to the lucky kids who participated in the US Marine Corps Reserve Toys for Tots Foundation’s annual toy drive with Lockaway Storage. 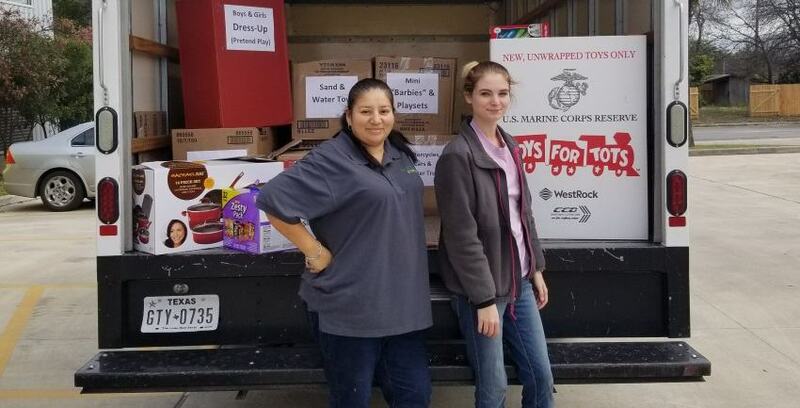 Patrick Galvan, Manager at Lockaway Storage in Converse, Texas and Tiara Thompson, Assistant Manager, played elves again this year as they helped collect a load of toys for those less fortunate. Christmas is a hard time for families who don’t have the money to make it as magical as it is on TV, but some children in San Antonio found a lot to be joyful about when they looked under the tree on Christmas morning! “It was really awesome this year! I started right when we were ready to go and we ended up getting about 21 boxes full of toys!” said Patrick. “Toys for Tots actually had to get a warehouse to hold all the toys they received!” Patrick said. Thanks again to everyone who made this donation possible. We’re looking forward to bringing more toys to tots next year!